The Kapi was first manufactured in 1950 in Barcelona (Spain). In 1955 the vehicle was completely restyled with the introduction of a new model called “Platillo Volante” (which translated means “flying saucer”). 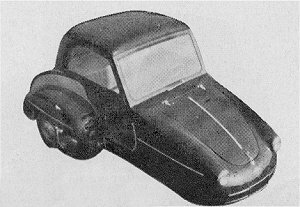 Although the vehicle was made in Spain it was powered by an English 8.5hp Villiers motorcycle engine which enabled the Platillo Volante to do 60mph and over 100mpg. The vehicle was started by a kick start pedal at the rear of the car. The body featured plastic doors and a light frame that meant it only weighed 397 pounds and stood 49” high. It came in various forms and was available as a roadster, combined station wagon and family car and as a cargo model. The cargo model was able to carry around 650 pounds at 48 mph. Production ceased in 1958.